Nisha Davdra, a UK based renowned mehndi and makeup artist has provided hair, makeup and henna services to quite a few International celebrities. Check out her beautiful mehndi designs inspired by paisley and peacock motifs. Nisha started professionally in 2004 with her first hair and makeup job. By 2008, she added mehndi to her list of services. She has also been associated with Pinewood Studios for creating beautiful henna for the ballroom scene for Disney Cinderella which releases in March 2015. Read on to know more about her exciting projects. (In case if you’d like to see the other interviews with mehndi artists, click here, here, here, here, here, here, here, here, here, here and here). 1. Tell us about yourself – when did u begin doing this and how did you think of getting into this line. I am an artist providing hair, make up and henna services to brides, film and media. 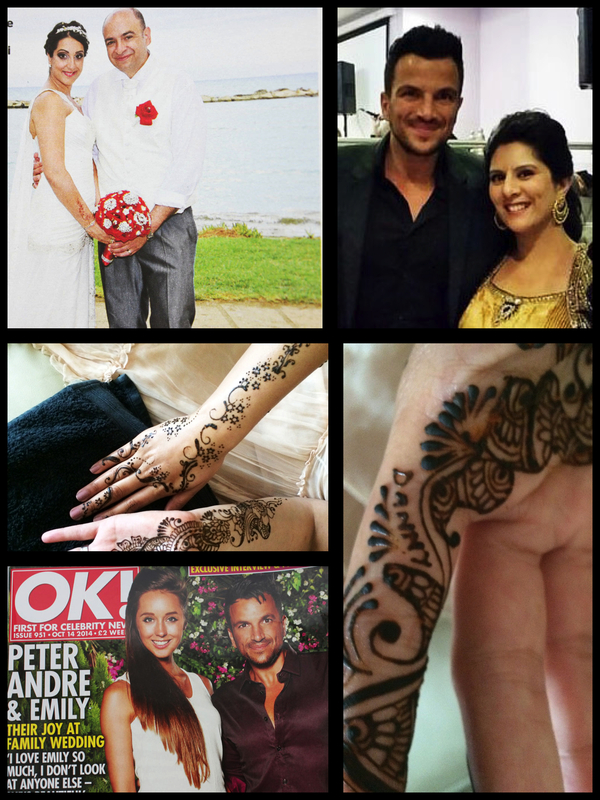 You may have seen me on Youtube where I teach on my channel Hennafied and my mehndi work was featured in OK! Magazine for the Nersian and Andre families for Sunny and Danny’s wedding. I find it difficult to describe myself or my business. It’s all so integrated. One bridal mehndi job can lead to a commercial media make up photo-shoot for the same client who then shops at my online store for Indian jewelry. So, I use my maiden name to describe it all under one umbrella., Nisha Davdra. I was only two weeks old when my parents bought their newsagents and that’s where I get my business head from. I’m not afraid to try something new. Davdra is my family surname and it makes me proud to carry my father and forefathers name forward. I strive to make my dad proud. My maternal aunt was the most stylish woman I knew as a child and I watched her getting ready, staring at her collection in awe. For my 13th birthday I had palettes and palettes of makeup given to me. I was in Heaven. My mother always made her own henna paste. It didn’t have any chemicals and wasn’t going to be harmful for our young skin. It was always an orangey paste and sometimes lucky enough for it to go red. The powder was often old and had sat in the kitchen cupboard for months. Cones weren’t commonly used back then. It was matchsticks and cocktail sticks for us using the most basic of patterns. When the big commercial side to Indian weddings hit in the late 80’s Original Make up Maestro Joshiv hitting the stands featuring in the first Asian wedding magazine. I experimented using her designs in mehndi and in eyeliners by tattooing on mine and my sister’s backs for Navratri. I started professionally 2004 when I had my first hair and makeup job. By 2008, I added mehndi to my list of services after my sister forced me to take a course with her. I thought I had no artistic flair and my father wasn’t keen on me pursuing this career. Adding mehndi was a great step forward. I had brides who wanted everything under one roof as a package deal and was a great turning point. I love paisley designs the most and that’s not just in henna. Wallpapers, clothes, jewelry designs, you name it, I love it. I doodle paisleys especially when I’m on the phone (did I mention I also have a day job!) Paisleys and peacocks feature in all aspects of my work. I love the variety of designs you can work around and within a single paisley. Mandalas are a feature which require perfection and patience. I am working with my own design book featuring the patterns I love the most. The ultimate designs are bride and groom figures. Mehndi which tells a story just amaze me. My brides often choose designs which I modify from Asha Savla’s Vivaah and Bhavini Gheravada’s Arabic style patterns. I was delighted to learn that Bhavini is related to my sister-in-law. My other favorite designers are Henna Visa, Gurpreet Kalsi and Riffat Bahar who was my own artist for my wedding and admire the work of many many others. 3. Most memorable experience you had while doing henna designs. Henna has given me the most memorable experiences of my life. Emotions such as crying and elation at the same time, jumping around and doing a happy dance. One that moves me to tears is when I was at Pinewood Studios creating beautiful henna for the ballroom scene for Disney Cinderella, directed by Kenneth Brannagh which releases in March 2015. It was my dream come true and I will forever be thankful for the opportunity to be a part of a Disney movie that will forever be watched for years to come by millions. I often wonder how I could possibly top that, when my father watched Peter Andre hold my hand and inspect his sister’s henna attempts on my hand he finally admitted that he was proud of me! That’s all I really ever wanted. 4. 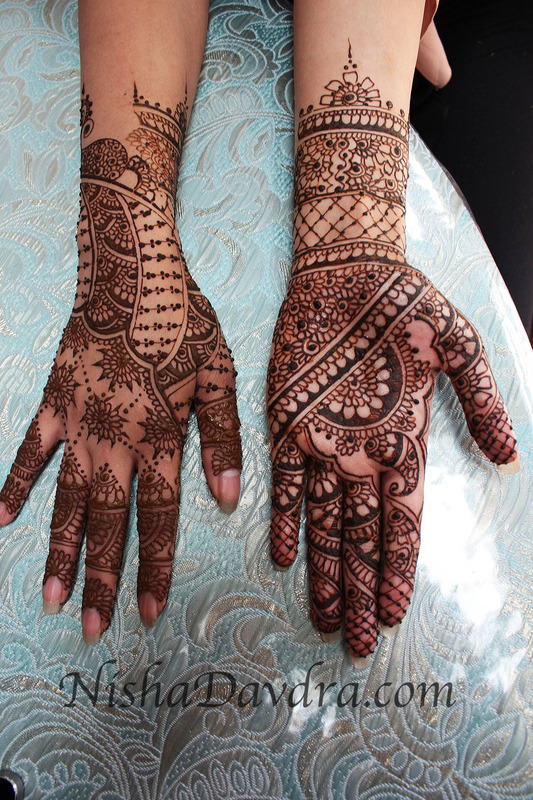 What are your most important tips to take care of mehndi designs after applied? Henna isn’t just about application and then leave. I provide aftercare advice to my brides in order to ensure optimum stain. I apply a mix of lemon juice and sugar to seal the henna. The citrus in the lemon allows dye release and the sugar holds the paste onto the skin for longer and is applied several times. I find this allows the henna to seep deeper into the layers of the epidermis which results in a long lasting stain. Water, swimming and cleaning chemicals even the sun can affect the stain. Poor circulation can also hinder progress of color. Henna draws heat away from the body and affect color, so I find it useful for clients to wear a shawl, socks and have a hot water bottle under the areas where I am working. I don’t allow my clients to wrap their hands and feet in socks or bags until after the paste has been removed the next day. The use of shop sold ready-made cones is not recommended unless you have bought them off a reputable henna artist who makes their own henna free from unsafe chemicals and is known to be against the use of PPD. PPD – otherwise known as p-Phenylenediamine is a chemical used in hair colorants. In ready-made cones, this has caused the most horrendous reactions and can potentially cause later reactions to hair dye. I couldn’t possibly imagine not being able to dye my grey hair EVER if I had reactions to PPD or risk scarring to my skin. I travel nationally and internationally and offer full bridal packages including clothes and jewelry. My full portfolio, contact and social media can be found at: Website, Email, Instagram, Youtube. Thank you Team Zuri for interviewing me for your informative blog. Click on the image to view them larger.